Looking for the best mosquito net in 2019? Mosquito nets prevent bug bites for campers enjoying summertime recreation. They also save lives in countries where disease-carrying mosquitoes infect children snug in their beds. First, What Are Mosquito Nets? What's The Purpose of a Mosquito Net? Do Mosquito Nets Really Work? What are the best all around mosquito nets? When I travel, I always take a mosquito net with me. They’re easy to pack, and I sleep better knowing the bugs can’t get me. I travel often enough that I’ve tested out nearly every mosquito net available! I hope you enjoy this list of the best mosquito nets money can buy. Short on time? Check out our top picks below, otherwise keep scrolling to learn about mosquito nets and how they can help you avoid nasty bites. According to the Oxford Dictionary, mosquito netting is a fine net or mesh hung as an obstacle to mosquitoes and other flying bugs. Mosquito nets that hang above beds and cribs are most versatile worldwide. Campers can hang nets from tents or trees. In homes with poor insulation or weather-stripping, a single net over the bed will be more cost-effective than sealing every possible entryway. The Centers for Disease Control and Prevention recommend sleeping under a mosquito net to keep bugs away, especially when traveling to countries known for Zika and malaria. I live in an old house without much insulation—mosquitos and other bugs find their way into my bedroom no matter what I do. Fortunately, mosquito nets come in a variety of sizes. When I upgraded from a double bed to a king, I upsized my mosquito net too. No more late-night bug bites! Insecticide-treated nets are treated with chemicals that repel or kill mosquitos. Most nets need to be regularly retreated to remain effective. The World Health Organization promotes the use of long-lasting insecticidal nets, or LLINs, as a measure for preventing malaria and other diseases. Read Also: What're the best products to prevent mosquitoes while camping? The purpose of a mosquito net varies by user. A child in sub-Saharan Africa may sleep under a mosquito net every night. A practiced outdoorsman in Mississippi might use a net to ward off flies and other pests. A resident of a subtropical climate may only unpack and drape them over bunk beds in the heat of summer. Mosquitoes typically bite between 10 p.m. and 2 a.m. Mosquito nets protect us while we sleep. Mosquito bites itch, and they can swell into large, red sores. Because mosquitoes draw and store blood, they carry and spread diseases. They are the best-known disease vector, a living organism that transmits infectious diseases to and from other living creatures. Besides malaria and Zika, mosquitoes can carry and transmit West Nile, yellow fever, and encephalitis. By hanging a mosquito net while you sleep, you defend yourself from an unfortunate range of potential problems. You can even use a mosquito net in your bedroom as a tasteful fashion statement! If a young girl wants to redecorate her room, a mosquito net can help her feel like a princess while also protecting her from bugs. If nets aren't your thing and you need more of an outdoor solution, checkout our guide on outdoor mosquito fans. Surprisingly, fans can be a great way to kill lots of mosquitoes without too many harsh chemicals. Mosquito nets are a proven means of preventing the spread of disease. The following video from UNICEF shows that mosquito nets reduce malaria deaths by 20%. If 75% of the African population used insecticide-treated nets, malaria would be eliminated. I’ve had the most luck with mosquito nets from Amazon, and the following five have most impressed other consumers and me. All are made from 100% premium polyester. None of them are insecticide-treated. If you’re planning a trip to any of the areas marked by the CDC as risks for mosquito-borne diseases, look into getting your net treated. The Rugged Rec is the highest-rated, but don’t discount any of these options. Depending on your needs, the HIG Canopy’s color preferences or the NATURO’s robust package may be a better choice. I’ll say you can’t go wrong with any one. These nets have protected my family and me while we slept after long, tiring vacation days. They can protect yours too! After our research around the internet, we've accumulated our top picks. Have a look below and leave a comment if you have any questions! Most of the other nets on this list hang from a single attachment point. 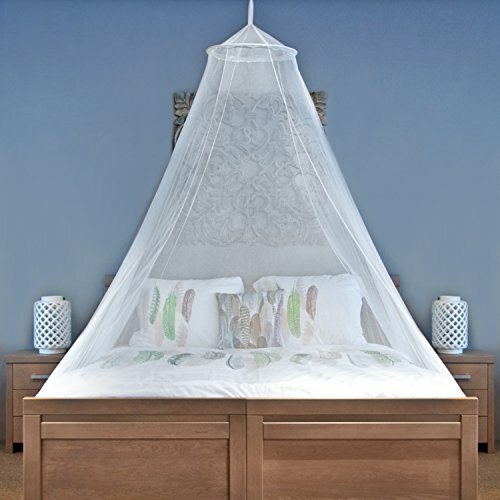 The EVEN Naturals Mosquito Net can hang from four or six points, depending on your preferences. As a result, this mosquito net is more rectangular than the others on this list. EVEN Naturals offers multiple net sizes. I like the linked size for my kids’ bunk beds when we travel. And these handcrafted nets are long lasting and durable—my kids have tried their best to ruin it without any success. The webbing contains 225 holes per square inch, ensuring no bug will find its way into the net. Air travels through mostly unimpeded. Best of all, the vendor donates a portion of the proceeds to charity. 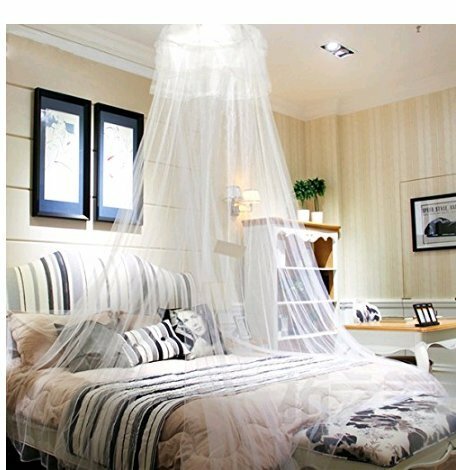 Of all the mosquito nets on this list, the HIG Mosquito Net Bed Canopy with its lace dome is best suited for decorating. Its elegant design drapes daintily from an easily installed adhesive piece of plastic. If you prefer, you can also install this with screws. Best of all, this is the only net of the five that comes in multiple colors: white, blue, pink, and even purple. But don’t let its girlish physique fool you. Though I’m unsure how many holes-per-square-inch perforate the webbing, this net does the job as well as the rest. While using this product, you won’t have to worry about mosquitoes or gnats or any other flying insects buzzing in your ears while you sleep. The HIG net can protect the surface of a king-sized bed. The Universal Backpackers Mosquito Net beats out some of the other options with an elastic bottom that fits snugly around the lower part of a mattress. The other nets drape lightly around the edges—Universal Backpackers nets create an impenetrable seal. To balance, the webbing of this net contains fewer holes by square inch, allowing for a more breathable sleeping experience. The larger holes concerned me at first, but Universal Backpackers produces its nets according to guidelines put out by the World Health Organization. I had no trouble when I used it. Honestly, I preferred the greater airflow, especially in terribly hot climates! This packing bag is made of taffeta and includes instructions on folding your net for easy storage. The net is large enough to defend a king-sized bed. I know these nets have added value to my life. I never worry about my kids contracting malaria. I never worry about uncomfortable bites driving us mad and ruining our trip. And when we’re at home in the summer, these nets make our bedrooms fun, welcoming, safe places to sleep.